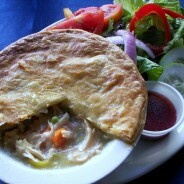 Our Fisherman’s Pie is filled with flaky white fish, shrimp, potatoes, carrots, peas, and leeks in a veloute cream sauce, topped with a pastry crust. 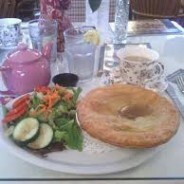 The pie is served with a small side salad. A traditional English meal of fresh ground beef, carrots and peas in a rich gravy, topped with a mound of whipped potatoes and melted cheddar cheese and served with a side of HP sauce. Served with a side salad. This is a “Gluten-Free” pie as it has no crust. 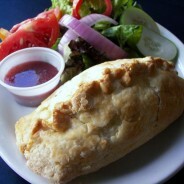 Filled with the best quality chicken breast, leeks, peas and carrots in a rich creamy chicken gravy and topped with a pastry crust. 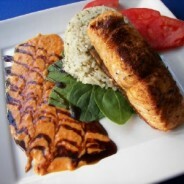 Served with a side salad. 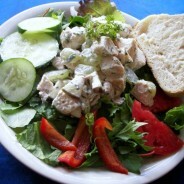 A generous serving of our homemade chicken salad with cranberry raisins, grapes, apples, and fresh basil served over a mixed green salad, with a slice of our crusty bread and butter. 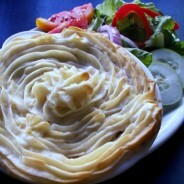 Filled with chunks of choice grade sirloin steak together with fresh mushrooms and carrots in a rich hearty gravy and topped with a pastry crust. Served with a side salad. 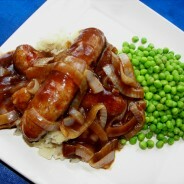 Two large Irish style pork sausages, served with creamy mashed potato, peas, and a rich brown onion gravy. 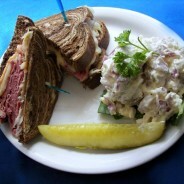 A traditional Reuben with a generous serving of your choice of turkey or corned beef, sauerkraut, Swiss cheese, and Thousand Island dressing on rye bread and served hot with our homemade potato salad or homemade cole slaw and a pickle.